The Foreign Secretary’s Special Representative for Climate Change, Sir David King, visited Guatemala 12-13 May for consultations with senior officials on a wide range of environmental-policy issues, including; global climate change negotiations, local environment-related legislation, and Guatemala’s leadership in regional discussions for a sustainable future. Sir David met the Minister of Environment, Michelle Martinez; the President of the Congressional Committee for the Environment, Ecology and Natural Resources, Boris Roberto España; the Vice Minister of Foreign Affairs, Carlos Ramiro Martinez, and the Head of the National Council of Protected Areas, Benedicto Lucas. During his meetings Sir David was interested to learn about Guatemalan climate change initiatives and hoped for fresh opportunities for collaboration would be possible as a result of his visit. Guatemala and the UK shared views on the challenges and opportunities presented by the Paris 2015 UN Conference on climate change and agreed to work together to achieve a deal that put us on course to limiting global warming to 2°C and avoid dangerous climate change. Sir David also met with civil society members including the National Association of Environmental NGO´s of Guatemala (ASOREMA) in order to understand some of the country’s main challenges such as the threat of droughts and flooding, and the work these organisations are doing on mitigation and adaptation. 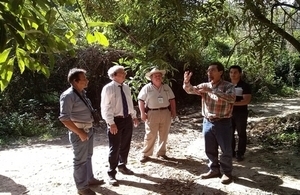 He joined the President of ASOREMA, Marco Cerezo, and paid a field visit to the Metropolitan Ecological Park, one of the city’s largest ravines located in Cayalá and used as a project for conservation and environmental education. He also gave a lecture at Universidad Del Valle de Guatemala (UVG), where he met students, professors and other environmental specialists and emphasised the need to avoid the impacts of dangerous climate change, as the results of failure to take action could be widespread, with serious consequences for human health, global food and resource security as well as economic prosperity. Guatemala is a strong UK partner on efforts to meet the growing global demand for a low-carbon future. UK ministries such as the Department for Environment, Food and Rural Affairs (DEFRA) and its Darwin Initiative programme, and the Department for International Development (DFID), have invested in several environmental projects in Guatemala, ranging from the protection of the Mayan biosphere, conservation of Guatemala’s Caribbean coastline and preservation of the country’s most precious wildlife.